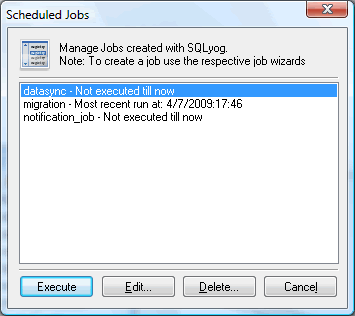 Using Powertools->Scheduled Jobs you can Execute, Edit, Delete jobs through SQLyog interface. To create a job i.e. Database Synchronization, Notification and scheduled backups, use their respective wizard. The current jobs are listed. Select the Job from the list and click on the respective button to perform the operation.